Land Rover Defender vs. Toyota Prado – Tug Of War! - Muscle Cars Zone! Land Rover Defender vs. Toyota Prado – Tug Of War! There is a good old saying which states that nothing can beat the old classics in the car industry, but we can never be 100% certain whether this is true or not. We could just exemplify with our personal experience or take a look at videos in which a classic car goes head to head with some modern machine. 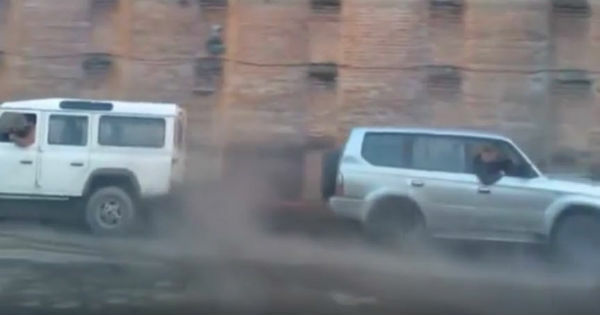 Thus we take a look at the this video in which an intense tug of war takes place between the mighty Land Rover Defender against the Toyota Prado. Though Toyota is known for making some exceptional vehicles, it seems that nothing can come not even close to the good old mighty Defender. Over the years the Land Rover Defender has proved its power but it is time for a new challenge against a very decent off road vehicle. These guys decided to settle down the ever-going debate on whether a good old rugged machine is always better than the new ones and fight in a tug of war. Everything seems ready and one man is filming the whole match. In a sudden brusque movement both off road vehicles are off to a mighty start. At the start it seems that the Toyota Prado holds up slightly better but then it is time for the Land Rover Defender. The driver inside pushed the gas pedal to the limit and manages to get the win in this tug of war. Though this might not be the exact answer on the debate, it is surely enough to once again prove the power of the Defender!